Discussion in 'Solo' started by SWNN Probe, Jun 7, 2018. 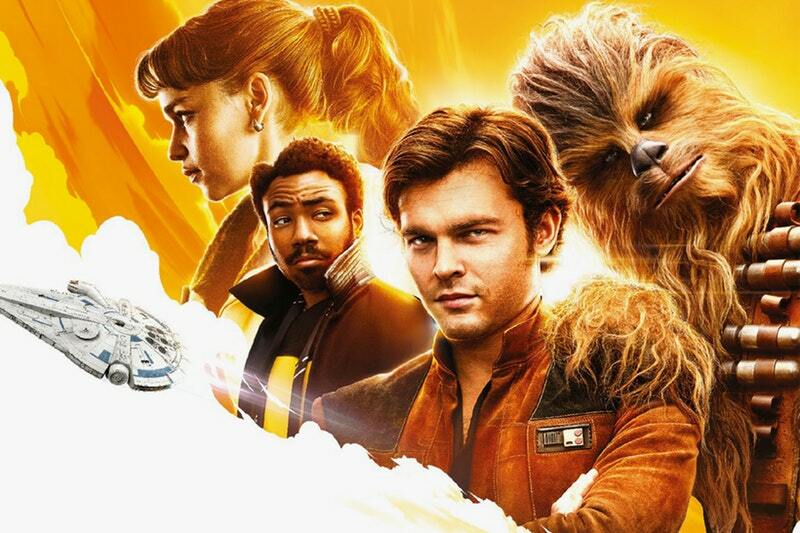 Shortly after the release of the film, some early details on the Blu-Ray options fans have for Solo: A Star Wars Story have appeared. While no release date has appeared as of yet, there's currently some cool packaging to look at. First up: Best Buy's 4K Ultra HD Steelbook, which features a sweet look at the Millennium Falcon. Meanwhile, fans who get a Target-exclusive Blu-Ray will have a little Millennium Falcon model to look at. Sadly, no special features have been revealed for either Blu-Ray bundle as of yet, and that's something we probably won't learn more about until we get closer to the actual release of the movie on home video formats. As of right now, Disney's next big Blu-Ray release, Avengers: Infinity War, will be hitting the shelves on August 14. 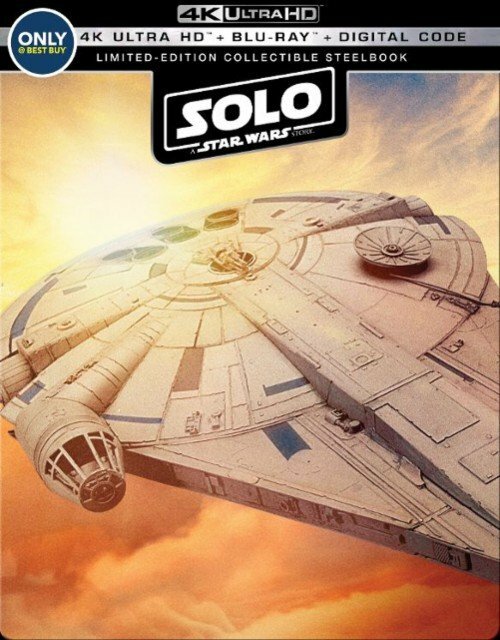 While we don't have a release window on Solo, we can presume that the movie will arrive on Blu-Ray in September. Special thanks to our reader Stefan Lawrence for the heads up. Target with the Falcon model for the win! I'd like to grab that steelbook but at the moment the model is too tempting. Luckily I have a bit to reconsider. I wish I all super loved it so I could even consider the instant double dip. In fact it is kind of cool that for the first time ever this could actually be a one and done since the 4k should be true reference quality and it of course comes with a digital so even if the disc is damaged or lost it is slightly optional to replace the physical copy. Even Last Jedi I'm going to have to buy another time because I wanted the 3D so I don't have 4k and already double dipped because I bought the digital HD to hold me over until I could get the discs from England. Oh well...I've had the OT I'm not sure how many times. At least three iterations of VHS tapes, DVDs, Blu-ray, digital, I'm definitely in on 4k, and I'd like the despecialized/proper original release though not totally pure so preferably the THX versions. Cleaning up the visuals a bit is nice but it is more the sound quality that I think is essential. Phantom Menace is a three peat since either it or the Matrix was my last tape (it was super nice too, best picture ever on a VHS, artbook, a strip of the film). The other two were DVD releases so only twice and a Blu is reference because they were filmed in 1080 so other than maybe breaking down and getting digitals I'm done with those so I guess that offsets ST double dips with the help of the high probability of Solo being a one timer. Here in Brazil, TLJ steelbook was the only to come with extras, and it´s sold out here, got it on the day of the release, Solo probaly will be the same. Well, looks like I wont have any other choice but to buy it from Target., which is also a 4K edition. Ugh.... I pride myself on having all the Steelbooks but man that mini Falcon looks sweet..!! One day I will invest in 4K so I should start buying them but don't think I could pass up on the Millennium Falcon this time. According to the Dutch webshop Bol.com (it's very big in the Netherlands & Belgium), the movie gets it's release here on blu-ray on september 26. The site is very reliable on it's release dates. If Disney does the same with the Solo release as with the previous SW-releases, the US will get it's release by the end of august or early september. Well since I don't have a Target REDcard and have the Best Buy steelbooks for TFA and TLJ looks like I'm getting the steelbook for this one too. 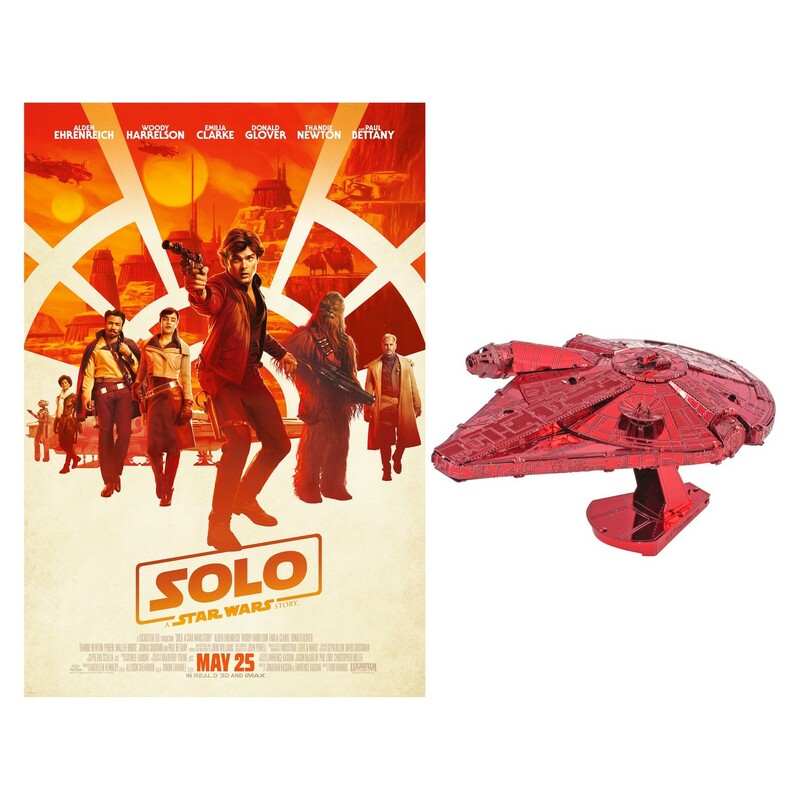 Personally, I like the look of the steelbooks a little more and while the falcon model is cool, I'm not a huge fan that it is red and that the target exclusive is almost $10 more. Looks cool, I dig the image on the back of the steelbook. Way too early to release it on Bluray, its still in the cinemas! Wait six months at least. I don't think it'll be released until September. Infinity War is slated to be released mid August and since Solo came to theaters about a month after that, that would put the Solo release at mid to late September. I think the release will coincide with the novelization. If I’m not mistaken, that’s being released September 4th. So we’re probably looking in that ballpark. That would makes sense. The earlier it comes to Bluray the better in my opinion. I agree. I don’t see any reason why not. There’s no sense in it gathering dust. It’ll do much better when it hits the on-demand audience I think. Honestly they probably would have released it earlier if Infinity War wasn't coming out right before. Disney probably doesn't want to have too much overlap between the two hitting the home release market. Yeah, I'll be pre-ordering from Target again. More details on the Target edition. Looks like it will ship by September 7 (see "Shipping & Returns"). I'll be getting the 4K disc, hopefully it will be released in the UK on the same day as in the US.